Summer is finally here! That means- time to get your beach bag in order. 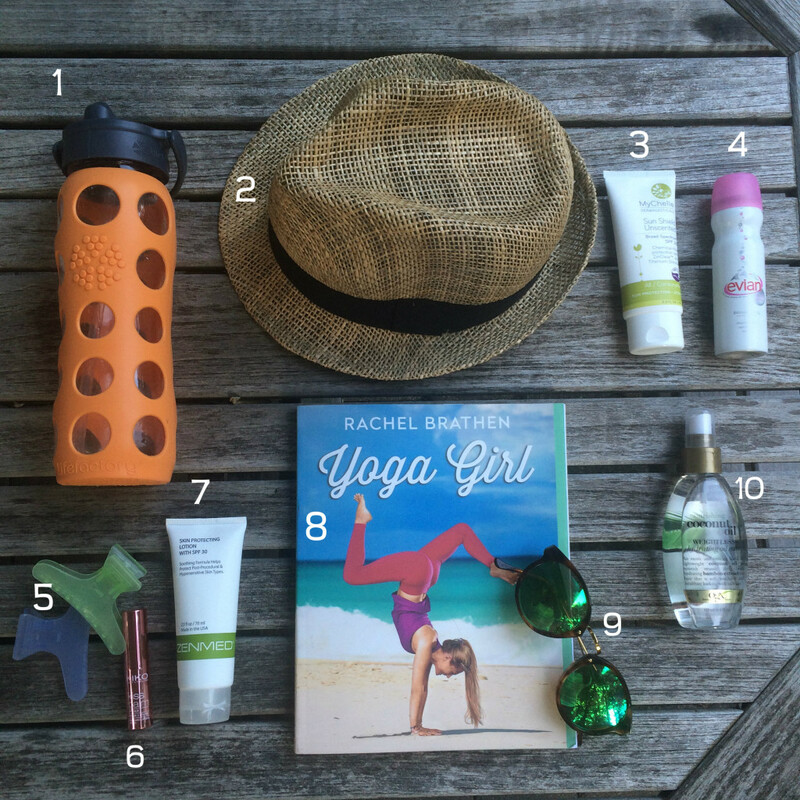 Here are my TOP 10 Beach Bag Essentials every DIVAlady must have! Get pure taste from a glass bottle and no worries about leaching from plastics. I got mine at Whole Foods but you can also buy online. See here why to choose glass over plastic when you have the chance! You can pretty much buy a straw, fedora type hat anywhere these days. I like this type of hat because it’s light weight, airy, stylish, and most all, covers my face from harsh rays. MyChelle is a current skin care fave go-to brand for me! I’ve been using this full spectrum, chemical free sunscreen for face and body because of the outstanding protective quality. This line can be found in your local Whole Foods, which also makes it that much more desirable to me… easy access! When you’re in your beach chair or on your blanket and need a quick, cool refresher, Evian Facial Mist is great. It is also good to use on long flights or in the morning before you apply your makeup. Instant hydrator. Whenever I am in Sephora I grab the travel size two-pack. Any jaw hair clip like the one pictured will do. I like to use these over an elastic hair band because it’s much gentler on your tresses and easier to swoop up salty or chlorinated hair (in my opinion). I pick up a few packs from Harmon’s Beauty Supply (any drugstore or beauty supply store will have these) to keep in the shower and my beach bag. I recently purchased this lip balm while I was in Italy and LOVED it! It’s nourishing and leaves a luminous finish on the lips…smells and tastes yummy too! If you’re abroad on any European adventures this summer, look for it! If I am spending a full day outdoors, on the beach, running the boardwalk, etc… I like to switch up my suncreen lotions throughout the day. My skin is sensitive and has a tendency to get red so I like to use Zenmed’s protective lotion. This is especially good to use before applying a mineral foundation. It blends easily and helps prevent skin flare ups. 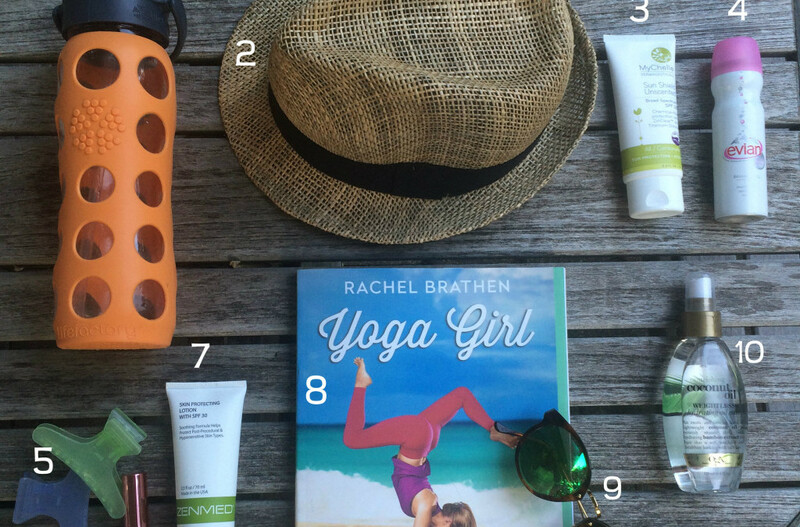 Currently, my beach read is a Yoga Girl by Rachel Brathen. Check it out if you’re in the mood to be totally inspired and have an interest in yoga! Good, quality shades are always a must. And some fab stylish ones like these don’t hurt either. Look for sunnies that block 99-100% UVA/UVB rays. I like to use this after a shower or a dip in the ocean. It helps to keep hair soft, hydrated and well nourished. Pick up a bottle at Ulta or a drugstore near you. If you have any beach essentials that you think are a must have, I’d love to hear from you! Leave a comment below. Happy beach days are finally here! Enjoy! NOTE: This post is not sponsored. All thoughts are unbiased and my own. Some samples were provided for review. All photos are my own.